Gel-Pac is a novel product delivery solution for newly hatched chicks and poults. Gel-Pac meets the needs of poultry hatcheries to introduce vaccines and nutritional products in a convenient and highly effective manner within hours of hatching. Due to application difficulties, this has not been done routinely until now. First developed as a delivery vehicle for probiotics, Gel-Pac can be used to deliver coccidiosis vaccines, prebiotics, phytochemicals, immune modulators, and the list goes on. Gel-Pac also aids in chick hydration, a vital benefit when preparing the birds for transport. Preparing a gel spray with Gel-Pac takes less than three minutes resulting in a stable gel that provides a uniform ingredient suspension. The ability to deliver ingredients that are normally insoluble is an added advantage, as the viscosity of the gel can be modified to ensure proper product suspension. When sprayed on chicks and poults, the colored gel-droplets ride high on the feathers, allowing for rapid and complete preening that ensures maximal ingestion of product without wetting and chilling the birds. Gel-Pac utilizes ASP’s novel stabilization system to protect and nurture fragile oral vaccines and probiotics. Gel-Pac easily adapts to current gel application technology. 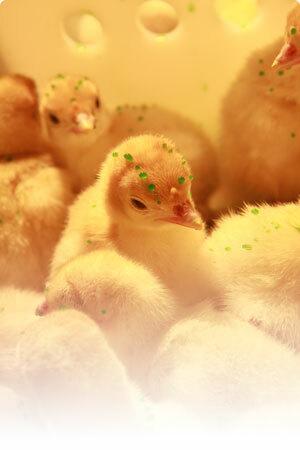 With uniform application, hatchery managers can be assured the chicks are being supplied the intended dosage of active ingredient with minimal waste. The gel application pattern can be seen in photo 1, and photo 2 demonstrates the gel droplets resting on the birds. Initial feedback from hatchery managers testing Gel-Pac highlights how rapidly the chicks preen the gel droplets, with complete consumption occurring within 45 seconds. At the launch for international distributors, many ideas were discussed for applications of Gel-Pac, clearly demonstrating the need for Gel-Pac in the hatchery. More investigation is planned by ASP to define optimal uses and efficacy for Gel-Pac; examples include color response evaluation and vaccine delivery. The solutions provided by Gel-Pac are numerous; let us discuss the ideal ones for you. Prepare Gel-Pac® by dissolving 1 pack (100 grams) into each 3-4 liters of cold water (10-24 degrees C). Concentration may be adjusted to provide the desired viscosity. 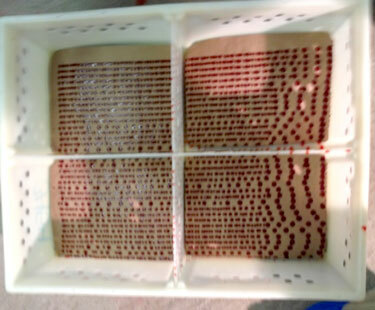 Uniform distribution of the green coloring in the gel spray solution assures the stabilizer is thoroughly mixed and will mark the tongues of birds. Thoroughly mix the desired number of additive doses into the gel, according to the manufacturer’s recommendations.